Battle Trance is an N.Y.-based tenor saxophone ensemble consisting of composer Travis Laplante, Patrick Breiner, Matt Nelson, and Jeremy Viner. Their debut album, Palace of Wind, was widely-acclaimed not only for its inventive arrangements, but for the technical prowess and physical ability of the musicians involved: from bouts of circular breathing, to stretches of ostinato that could best be described as “Reich-on-amphethamines,” the four members of Battle Trance brought Laplante’s stunning vision to life. 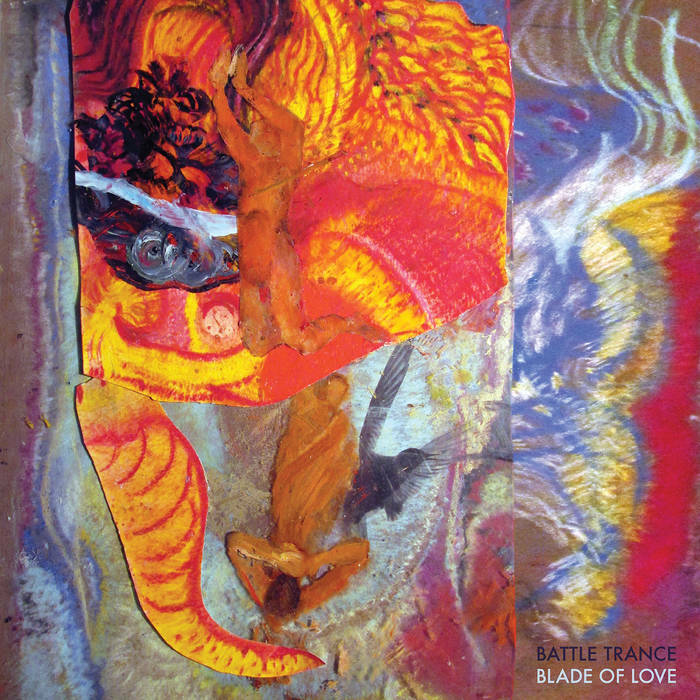 Blade of Love, though preserving a 40-minute run-time, raises the stakes considerably - the techniques are more complex, the endurance needed greater, and the pieces themselves seem to reach even further into the ecstatic sound-world that the previous recording tapped into. There were certain specific sounds that I imagined being in Blade of Love, but I couldn't get close enough to them using traditional saxophone tone — sounds like arrows flying through the air, birds singing or flying overhead, bombs, water running, the wind, campfires, singing in church, making love, killing, waves crashing, fighting for your life, thunder, the sound of rage, howling, crying, laughing, the sound of my last breath...So I began working on different ways for the saxophone to get closer to these sounds, and the resulting techniques became part of the fabric of Blade of Love. This approach to composition - capturing life in music, from the meaningless minutiae to the most emotionally-resonant moments - is not particularly novel; composers like Olivier Messiaen staked out similar artistic territory in the mid-20th century. What is novel is the limited toolkit that Laplante has given himself to work with. While many composers would require an orchestra to realize a similarly-comprehensive vision, Laplante makes do with much less. As the old adage goes, “restrictions breed creativity.” In Blade of Love, we can hear these restrictions being trounced left-and-right, and we can hear what happens when what Laplante calls a “torturous and demanding compositional experience” gives birth to a wondrous and transcendent set of sounds. The first piece opens with a major-key drone, one that is only slightly deceptive; Blade of Love is not going to be an exercise in blissed-out exaltation, or at least not in the way that you’re accustomed to. There is a sense of reverence here, but it’s one that encompasses both the divine and the depraved - one eye on the heavens, and one on the wreckage below. After the initial drone, the piece gives way to one of the extended techniques the group employed during the sessions: that of singing “while exhaling through the saxophone tubes, using the instrument's keys to shift the timbre of their voices.” This is one of the many idiosyncratic methods by which Battle Trance change the relationship between performer and instrument, so that the distinction between the two is muddied and, at times, completely erased. After this brief, hymn-like stretch of pristine vocalizations, the group returns to the interlocking motifs and contrapuntal flurries that most firmly connect them to the minimal music of Steve Reich, Terry Riley, and Philip Glass. As the first compositions nears its end, Battle Trance transition into a fast-paced whirlwind of repeated phrases that sometimes align and sometimes pull apart; in the final seconds, the vortex becomes a series of martial squawks. The bellicose calls of the first piece’s conclusion lead directly into soft gusts of wind at the beginning of the second. Such contrasts perfectly illustrate the all-encompassing reach of Laplante’s vision - shouts of war collide with gentle stirrings of the breeze, and both come to seem equally necessary. Midway through the second piece, one of the most bone-chilling segments occurs: in unison, the quartet lets loose a series of screeches that, to my ears, sound like sirens. These effects never seem excessive or gratuitious, however - each sound, however jarring or unexpected, fits perfectly into the overall structure. In the final movement, Battle Trance turn again to the beatific vocalizations of the beginning. After all the sirens and guttural grunts, the third piece seems to be an act of consecration: angels sing, light gusts of wind flutter by. Of course, Laplante is not content to let the sounds simply melt away - the final three minutes constitute the coda, a burning echo of the interlocking shapes that the group produced in the opening piece. As I listened to Blade of Love, I wondered just what a “blade of love” was supposed to represent. It could simply be referring to the power that love has to remove obstacles and difficulties - a tool with which we can remove our enemies by, ultimately, transforming them. A sharp edge that cures as it cuts. Additionally, the blade could be a symbol of the contradictions and incongruities that seem to lay side-by-side not only in the music of Battle Trance, but in the world at large. It could be both of these, or neither at all. In any case, Blade of Love is an inspired work of art, one that cuts across boundaries and offers up a view of life that, while not always pretty, is always hopeful. A triumphant album, and one of the best of 2016!